You must have heard about how exercise benefits the whole body system with numerous numbers of exercise equipment contributing to that. 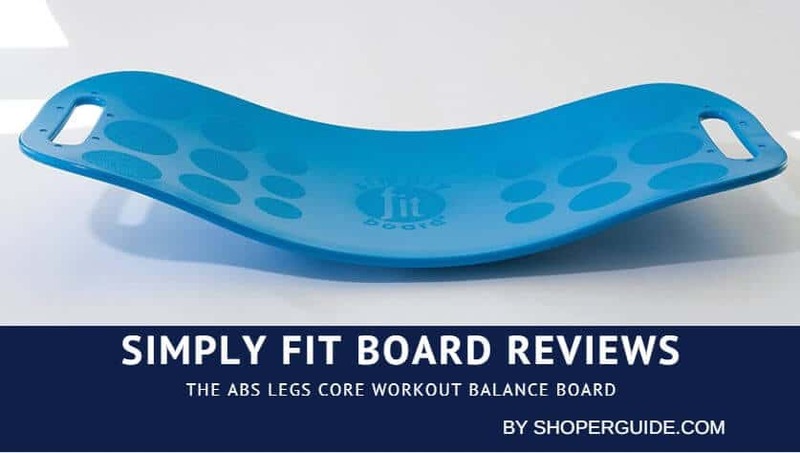 Well, our focus in this article is on the simply fit board reviews, as we want to reveal to you one of the unknown, yet effective exercise device in the market today. There are different exercise equipment that can be used for workout depending on the type of training you want to get involved with. For those in search of the best exercise equipment to tone their muscle and strengthen some core muscles, the simply fit board is the perfect answer to that. This is a plastic device that is designed to help tone muscles and burn calories while building your balance and coordination. Its uses requires standing on the board, twisting and rotating to get the best out of the training board. How do Simply Fit Board Works? Simply fit board, without doubt, is one of the simplest fitness equipment that is viable to work on your waist fat. Most people prefer using fat burner supplements just because they don’t have the luxury of time to visit the gym. However, you can rely on the simply fit board to help you with fitness routine without going to the gym by doing your workout right in the comfort of your home. It is a perfect replacement for heavy-duty exercise equipment and it works excellently. All it requires is just to strike your balance on it and move the board. It is a long-term process for burning fat but it is very effective for those who don’t like to hit the gym. The very first question that will pop up in your mind while in the market to get the simply fit board is what weight can this board hold? Generally, these boards are strong enough to hold up to 500 lbs so you have no worries about damaging the board. The board is made of strong and sturdy plastic with a high level of durability. Much fat in the body isn’t a sign of good living and that can cause a demeaning effect on one’s overall wellbeing which is why you must ensure you do all that is necessary to shed those weight. The use of the simply fit board is sure a perfect place to start with. How to use the Simply Fit Board? Just place the board on the floor either on a rug or carpet. It isn’t advisable to use of hardwood flooring because it can easily slip and you might end up getting injured. Once you have it in the floor, carefully place your feet on the outer edges of the board. Just locate the last set of circles on the board and move your feet towards the area. While mounting the board for the first time, you can hold on to an object in front of you to get your balance. This act will make your workout safer thereby reducing your chances to fall. Once you’ve got your balance, gently move from side to side and repeat this for some minutes until you are totally comfortable. Now, you need to know which types of exercise you can do with this board. You have to stand on the simply fit board by balancing your feet on the edges. Ensure your torso is straight and upright. Endeavor to hold your balance for 30 seconds. Repeat this for 5 sets, each of 30 seconds. Note: This exercise is for the beginners, and it will help you in developing your balancing skill and increase your stance confidence. You have to stand straight on the fit board by ensuring your feet is on the edges. Now, try to move your weight from your left leg to the right leg so as to tilt the board sidewise. With your torso in the upright position, tighten your core and make a steady movement. Note: This exercise will enhance the activities of the muscles of your ankles. As in the case of upper exercises, just stand on the board. Tilt the simply fit board to the front and ensure it touches the floor. And then with your heels, you tilt it back to touch the floor. Note: This exercise is a very good one for muscle toning and stabilizing your ankle muscle. With your feet on the outer edges of the board, maintain a straight spine. When you strike a balance and you are comfortable, go down and come to the squatting position. Place your hands straight in front of you. Again, return to the starting position and repeat the exercise. Take Note: This is the perfect fitness exercise you can do with these simply fit board to strengthen your core gluteal and thigh. Since this involves throwing and catching a ball, you need someone to help you out. Just find a partner and instruct him/her to stand at least five feet away from you with a ball. Instruct him/her to throw the ball to you and catch it at the height of your chest and repeat this several times. Above are all the exercises and benefits of using the simply fit board. Before going into the benefits of using the board. The board isn’t just for those who can’t get to the gym but can also be used to compliment your gym workout so as to get a better result. What are The Benefits of Using Simply Fit Board? You want to spend on products that will give you positive outcome. The simply fit board can make you to make you a better athlete as it improves your agility. Workout on simply fit boards is safer than using some other machines and it has lesser chance of injuries. The board doesn’t only help with building good posture, toning muscle, enhancing balance and coordination but also play a role in enhancing the brain cells. The simply fit board comes in four different colors such as blue, green, magenta and orange. The simply fit board is fun, easy and effective to use for workout. Is can be used for people of varying ages and body types. The board is lightweight and can be carried anywhere without hassles. It is portable yet very strong to support up to 400lbs and it helps to strengthen and tone abs and increase the leg muscles. Its operation is very simple but you have to inform your doctor or your physician about the use of the board if you have an injury or just recovering from one. To get started, you need to maintain a balance. So just put your feet on the outer edges of the board and ensure you hold onto any object in front of you as support if it’s your first time on the board. Thereafter, you can slowly rock the board side to side, front to back to get the best of the board. This board can be used to do different exercise which we have listed above. So you choose the type of exercise and follow the instructions guiding it to ensure it done rightly. Also, the board comes with user guide and a DVD to help you out with the use of the board. Q: On what type of floor is it ideal to use the board? A: it is recommended that it should be used on carpet. And for those that intend to use on hardwood floor, it is advisable that you use a rug on the floor so that you don’t fall off the board easily. Q: I’m having trouble balancing. What can I do? A: this happen during the first time of using the board. So I suggest you hold onto any object in front of you to get your balance until you become mastery of it. A: Twisting should be at the waist, and your knee joints shouldn’t move. The perfect way to get the motion correct is to hold your hand weights straight down at your sides and swing your arms in a semi-circular motion, with a slight bend in your knees. Just when we decide to stick to simply fit board, we found out there are some other quality fit board you can consider. 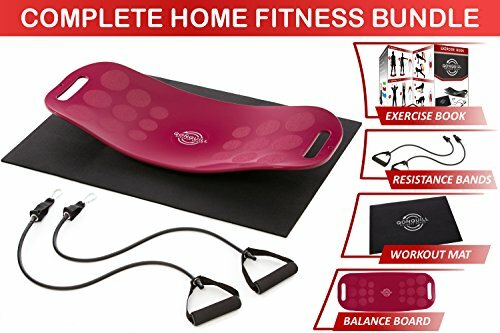 This is a premium exercise board that comes along with a workout mat, two resistant bands which makes it ideal to improve one’s balance, build core, abs, arm and legs muscle. It is very essential for toning your entire body and enhancing your balance. The fit board is made of extremely durable and sturdy plastic which can support about 400 lbs and it is well fashioned with a special anti-slide surface to make training safer and reduce your chances of falling. It can be used anywhere in the house because it is small, portable and easy to carry from one place to another. The board can be used on hardwood without any fear of falling off unlike the simply fit that can’t be used on hardwood floor. It can also be used on tiled and carpet floor. It one of the best to use to get your whole body in good condition. It tones the whole body and it is a good exercise device for complete workout. The types of the exercise you can do with the board has been clearly stated above so it is advisable that you read and follow the instructions on how to effectively carry out the fitness routine without stress. For a complete workout card, make use of the exercise workout card and you should endeavor to try all exercise for about 15 to 20 minutes per day. Also, you can add a hand weight to the workout on the board to increase difficulty. 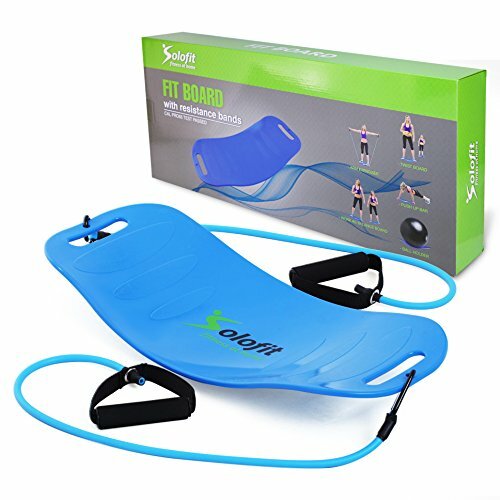 The Solofit Balance Board-Fitness Board is the last to discuss here. It is a versatile exercise board designed to help you improve coordination and balance, gain strength, stability and endurance. It is very useful for everyone of different age group. It is well built and comes with a sturdy design with a special band which is ideal for resistance exercise for your arms, back, chest and shoulders. It doesn’t slip and you have no cause to worry about anything. It is made of quality ABS plastic that is durable and strong. It is lightweight which makes it easier to move from one place to another. The board can be used for different exercise such as push-up, leg exerciser, plank board as its goal is to get you in better shape without hitting the gym. It comes with 100% guarantee which means you can return it on the off chance that you don’t like the board or you want a replacement. It works just like the two listed above but quite different from simply fit board because it can be used on hardwood floor while simply fit board can’t be on the hardwood floor. Exercise should be a daily habit as this helps you to keep fit and also reduce your chances of getting sick. Treadmill and some other high end exercise machine might be too expensive for you and that must not stop you from exercising which is why we’ve made a research on the simply fit board reviews for you. The board is a simple device that can be used for different type of exercise. Find out more above.